1628101733 -The Fifth Edition offers a comprehensive introduction to legislation and administration in the regulatory state. Importantly, it features new chapters addressing regulation, including constitutional structure, the types of agencies and their tools for statutory implementation under the Administrative Procedure Act, oversight and review of agency action by all three branches, and judicial deference to agency interpretations. The Fifth Edition also updates the book’s classic and path-breaking treatment of the theories and practice of statutory interpretation. It devotes expanded attention to a range of textualist theories, dictionary use, and reliance on language and substantive canons, as well as providing the key statutory text as a preface to major cases. And the new edition contains an in-depth introduction to theories of legislation, the legislative process, representational structures, campaign finance, regulation of lobbying, and direct democracy. 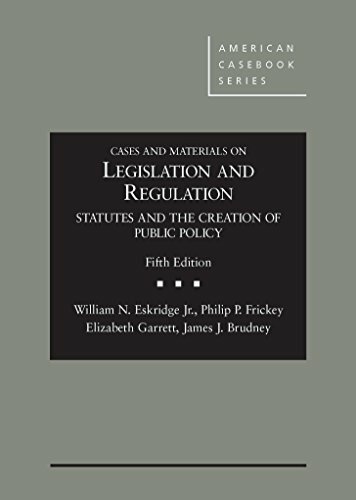 The Fifth Edition is perfect for 1L Legislation and Legislation-Regulation (“LegReg”) courses, and it remains the go-to book for upper level courses.